1 Timothy 6:15 “which God will bring about in His own time. [He is] the blessed and only Sovereign, the King of kings, and the Lord of lords,” Bear in mind that Christ is NOT Sovereign. How do we know that? “sovereign >noun 1 a king or queen who is the supreme ruler of a country. 2 a former British gold coin worth one pound sterling. >adjective 1 possessing supreme or ultimate power. 2 (of a nation or its affairs) acting or done independently and without outside interference. In this riddle of the Scriptures, you will come to understand that Michael / Christ Jesus is a King, but not the Sovereign King. Michael represents Yahweh’s warrior side in attributes. In representation of Yahweh, he wears those titles, because he is the mirror image of Father in representing Her Sovereign Authority by bringing Her Decree of Judgment upon evil, both human and spirit. Christ will be subject to Mother Yahweh because for a time, She subjected everything to him; now consider that kids; and in subjection of all things to Christ Jesus, and the fact that he is a mirror image of Yahweh, he can wear those titles in respect of Yahweh’s throne, because he will eventually turn the titles back over to Father with all that he possesses; yet, Christ will remain a King, because Father has Decreed he will be one for eternity. One of those “powers” was to split off his energy. his “authorities” over angels, they include his own split-energy, because he has authority over everything below Yahweh on the Ladder of Authority. A trusted position he earned and paid for in his own precious life-blood that was drained out of him on the Cross of execution. Who did Jesus tell his disciples to give thanks to? Was it him (Christ), or was it our Beloved Mother Yahweh that is everyone’s, including Christ Jesus’ Father? And, who is love? Father is pure love; Her love is eternal because She, unlike Christ Jesus / Michael has NOT existed throughout eternity, but Father has. How do we know that? Colossians 1:15 “The Centrality of Christ. He is the image of the invisible God, the firstborn over all creation;” He’s the image that we can all see, because Father’s presence (power) is within, but we are within Her; that makes Father’s physical appearance unseen, so She is what? Invisible; literally so, because She actually exists beyond our reality; within Her, we are encompassed; and, Michael was the first creation, because out of Her he was born into a START. The start was before the reality he created with Father’s guidance; as the “The Centrality of Christ” he was born as the SECOND ADAM through Mankind. Something good coming out of something evil; literally. And that kids, is why the pic of that wheat field shows that around the LIGHT revolves all things in creation, because he is Father’s central focus on bringing forth his Kingdom; and, Michael will stand up in these end times, because that means: HE SPLIT OFF OF CHRIST JESUS to act as the executioner of Father for a Judgment decreed long ago against Mankind for disobedience. Michael is under Christ’s Authority, so he is what? A Prince; this being true even though they are one in the same; but because of the phenomena of splitting the atom or energy, he is subordinate to his higher half as well as Father; Michael has the COURAGE to carry out Father’s will in this Decreed Judgment; “the book of truth” is the WORD and the Word is his guide that comes from Father’s Living Word, Christ Jesus. 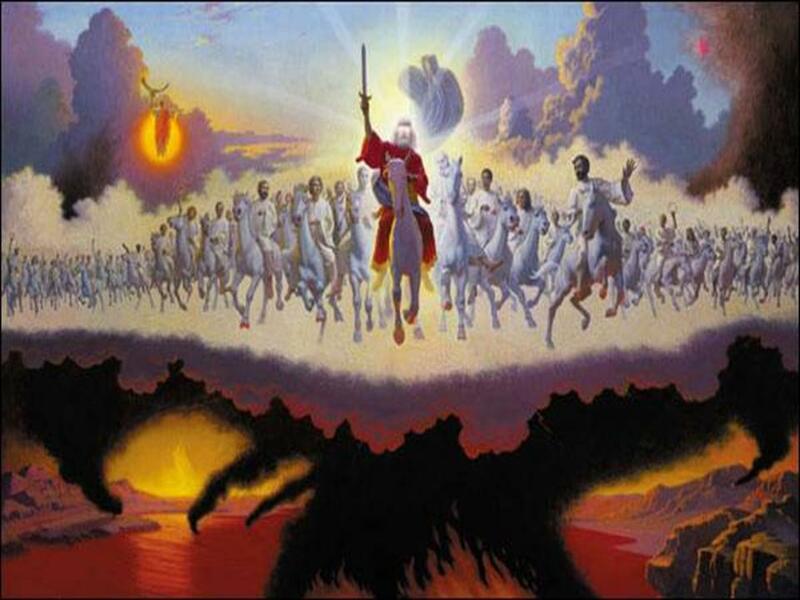 Michael has been standing watch over the faithful; Christ sits at Father’s right hand until what? The truth behind that statement, is that “earth” is the cosmic dust throughout creation; however, Heaven is where Father’s presence resides, but not totally; Yahweh is everywhere, because everything is Yahweh, including the evil; why do I say that? Because Father owns everything; everything exists because She Wills it; the evil though, it has to be cut away; Father’s use for it is about run its course this side of Armageddon. Now think about this: The fallen angels are begging for forgiveness, because ole Dawn is back up to his dirty dealings; but as an example of those that break Sovereign Law when they were fully enlightened, they must serve as examples to kingdom subjects and all future life that comes into existence; just like when the FLOOD came and killed off all the animals and virtually everything that took a breath, Father is permitting much of Her animal Kingdom to die off here in these last days of this old system of things; and those animals are blameless in Father’s eyes; they just got caught up in Dawn’s misdealings that have led to dire consequences for every one and everything on this dying planet; is the Earth dying? YES it is; but Father won’t let it happen, and is why She’s intervened against Mankind’s harsh treatment of Her property’ Father is altering the Earth as I write this; She is also letting things get worse as far as Mankind goes, but will pull the Earth back from the brink of destruction; the oceans are polluted and all ecology is dying; it will be replenished by Christ Jesus and Father’s life-giving force. But before that happens, Mankind will certainly look bleakly at what they think is the end of not only Planet Earth, but their own. The latter they got right, but not so for the Earth. The last Armageddon, everything in the sea was spared that did not breath like we do, but this time, everything in the seas are going to either wash ashore or create the largest cesspool of dead carcasses in the history of creation; thanks to drilling for oil and the dumping of toxic waste including nerve gas, the seas require a miracle to bring future life back to them; and just as it occurred back in Noah’s post-flood era, Yahweh’s angels replanted and brought back much of what was lost at that global flood; this time the seas themselves will not be spared; great whales and every sort of sea life will soon be floating on the oceans with the stench rising to the heavens; people will be committing suicide in mass when they realize that this planet is beyond Mankind’s help; no science they have developed can halt nor rectify what is just ahead. This entry was posted in Archangel Michael, Chris's Kingdom, Christ Jesus, Yahweh and tagged King, Michael, Queen, Sovereign Titles, Yahweh. Bookmark the permalink.